If you want to carry out some serious stock prospecting, it helps to have some tools that make your life easier. If you want to just trust the views of what the company put out or the experts that’s ok. Going through the exercise yourself makes you understand some of the figures of the deal better. 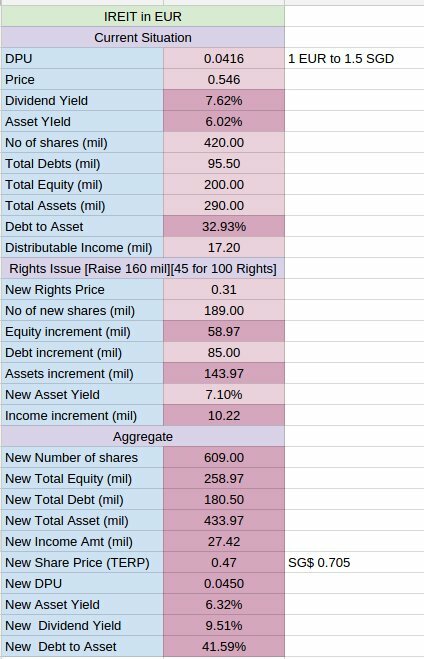 If you are a person that invests in stocks that throws out a lot of rights issue (hello REIT and business trust investors) and placements, come up with a template to make your evaluation job easier. IREIT Global came up with a 45 for 100 rights issue that will use part equity and part debt to fund a Berlin property purchase. The purchase will be worth EUR 144 mil and the net property income yield of the new property will be 7.1%. The first thing that you want to do is have assess to the documents to know where to plug the numbers. This would be the SGX Announcement Section. You want to find the company and get some of the latest information of the placement or rights issue. In this case, I pulled the latest quarter result of IREIT to find out the financial state before the potential acquisition, and the announcement of the acquisition. I always have handy spreadsheets around to help me, and you might want to come out with yours. But as a primer you may want to take reference from the one that I use here. Go to File and Make a copy… and go crazy with it. The above figures are in Euros, since the financials of the REIT is in Euros. The section is broken up into 3 parts, before the acquisition, the terms of the acquisition and what happens after. The acquisition can be funded with debt or equity. 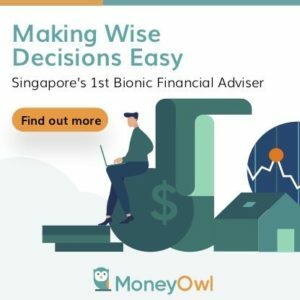 If your acquisition is funded with a third thing that is preference share, then you got to modify it accordingly. I’m sorry it doesn’t do that now. In this example you can see the asset yield and dividend yield prior to the acquisition and after. To be accretive the dividend yield per share should be higher. In this case it is. The new balance sheet can be checked fast as well. The debt to asset went upfrom 31% to 41.6%. The price after factoring the rights is shown here as SG$0.70. You might want to also check out a past article along the same lines, but talking about evaluating share placement instead.